Calling card of the Ku Klux Klan. Text reads, "Invisible Empire / Knights of the Ku Klux Klan / YOU HAVE BEEN PATRONIZED BY THE KKK / For Free Information Write / P. O. Box 700 Shelton, CT 06484"
Also printed on the card is a black and white cross within a red circle. The cross has a red drop-like shape at its center. This is a symbol that originated with the "Second Ku Klux Klan" of the early 1900s. The cross-like shape is formed by four letter "K" images arranged in a square facing outwards. In the center is a yin-yang symbol. Eventually, the four letters were re-oriented to a more vertical position, causing the symbol to look like a cross instead. At the same time, the white part of the yin-yang symbol disappeared, leaving only the colored part, which resembled a drop of blood. Today, this symbol is known as the MIOAK (an acronym for "Mystic Insignia of a Klansman") or, more commonly, the Blood Drop Cross (See ADL, Hate Symbols Database). 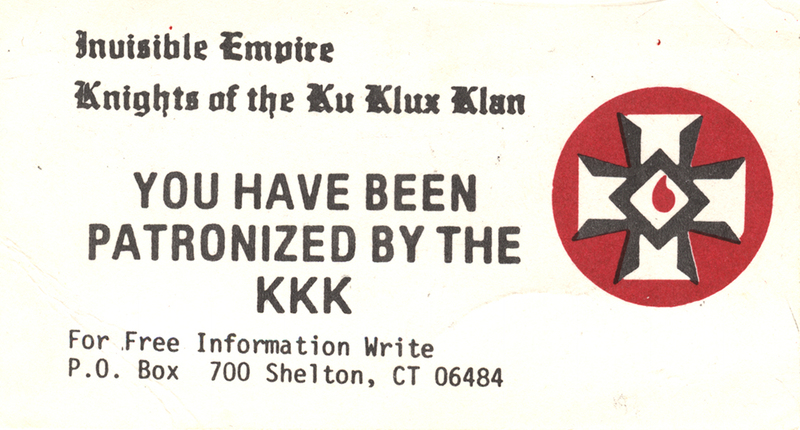 Verso of this card has information about the mission of the Ku Klux Klan. “Invisible Empire, Knights of the Ku Klux Klan [calling card],” Social Welfare History Image Portal, accessed April 24, 2019, https://images.socialwelfare.library.vcu.edu/items/show/287.